The first time I went online was in the fall of 1995. A librarian at the main branch of the Charlotte Mecklenburg Library taught me to type website addresses into the browser. I was amazed by the infinite scope of information at my fingertips. That day I joined the burgeoning information revolution and the internet became part of my life as a student, professional and father. In all these roles I have witnessed the power of technology to improve people’s lives. Unfortunately, many people aren’t able to benefit from transformational digital tools and skills. More than 60 million Americans don’t use the internet in the home. In my city, Charlotte, NC, 28% of residents don’t have internet access in the home. These families are put at a disadvantage when it comes to finding a job, completing homework and communicating with relatives. I wanted to help address this disparity, so I went back to where it all started for me -- the library. I have spent the last year working as a Digital Inclusion Fellow at the Charlotte Mecklenburg Library. 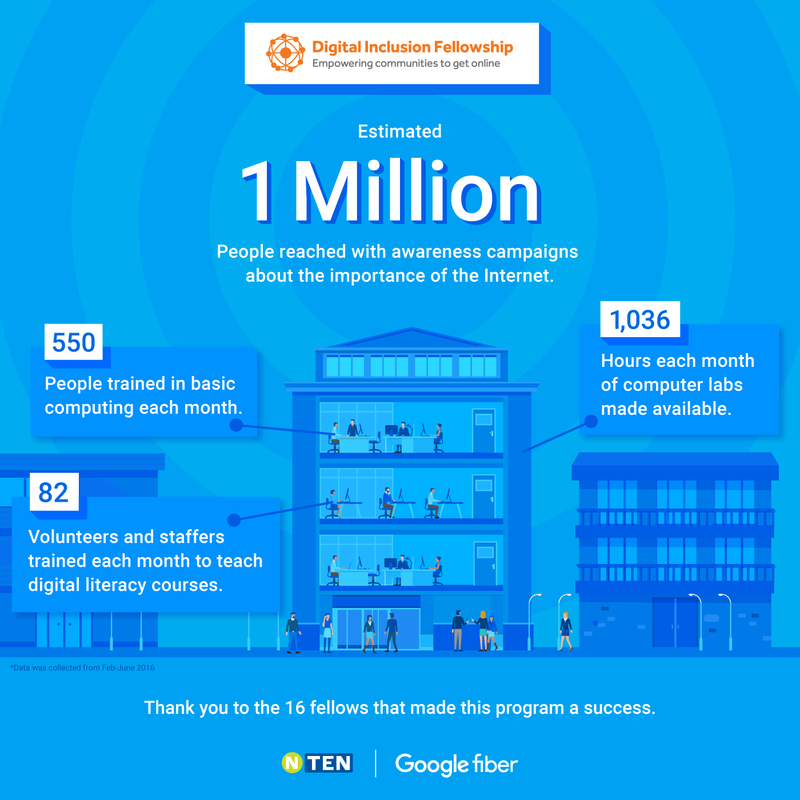 The fellowship is a program facilitated by the Nonprofit Technology Network (NTEN), in partnership with Google Fiber. This first-ever fellowship to address the digital divide embedded 16 community leaders into local organizations that are working to close the digital divide. Collectively, we helped our host organizations address barriers to widespread internet adoption, such as awareness of the internet’s importance, digital literacy and access to affordable devices. I became a Digital Inclusion Fellow to help shape how our city embraces new technology, while ensuring that our entire community benefits. Thankfully, I was joined by others across the city who feel the same way. The library was one of the key members in developing the City of Charlotte’s first Digital Inclusion Task Force, along with Charlotte Mecklenburg Schools, Goodwill Industries, the Knight School of Communication and Mecklenburg County. This group of dedicated individuals and organizations is continuing to meet the challenge of making Charlotte a more digitally inclusive city. The library, which has 20 branches and serves around 1.1 million people, has already been a steward for digital inclusion for two decades in Charlotte. I joined the library’s leadership team to scale programming, sustainably. We mapped internet adoption in Charlotte and focused our resources on the least connected communities. We piloted classes in these digitally divided communities, teaching residents basic computing skills. The course we developed, DigitLit101, has several modules, including email and job searching. To support our 1:1 training format, we trained 71 library staffers and dozens of volunteers to become DigitLit101 instructors. We also partnered with community based organizations, such as the YMCA, to help them incorporate DigitLit101 into their programming and scale our impact. Overall, this course has served 183 students in seven library branches in both English and Spanish. The other Fellows were busy in their cities as well. Collectively, we trained 550 people per month and reached an estimated 1 million people with awareness campaigns about the importance of the Internet. You can read case studies from my city, Charlotte, as well as Nashville and Austin in the Digital Inclusion Toolkit that launched today. The toolkit highlights some of the successes and challenges Fellows and host organizations have encountered throughout the first year. Additionally, the toolkit includes best practices in volunteer recruitment, classroom logistics, digital literacy, and partnership development. It’s a great resource for organizations looking to join the digital inclusion movement. I am passionate about social justice and I believe that access to reliable, affordable internet access at home can have a transformative effect in people's lives. Our first fellowship year was a success, but we have more work to do. Twenty-two new Fellows in 11 cities are taking up this challenge for the coming year. As they begin their work, I’m reminded that joining the information revolution can start with something as simple as teaching someone how to use a web browser at their local library. Guest post from Ruben Campillo, former Digital Inclusion Fellow, currently the Digital Inclusion Outreach & Community Engagement Manager, Knight School of Communication, Queens University of Charlotte.